iPad and Mac Mirroring – How to stream Video from Mac to iPad and Vice Versa? Home » iPad and Mac Mirroring – How to stream Video from Mac to iPad and Vice Versa? 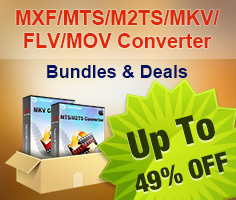 These days there are plenty of households with more than one Mac, plus any number of iPad, iPhone and Apple TV devices. You can sync new iPad with iTunes library every week or two, but it is troublesome to transfer a single movie to iPad just to play it for once. A good idea here is sharing your iTunes library with iPad wirelessly, so that you can play any video and music from your Mac when you like - without transferring them to your iPad. If you’re only interested in streaming over your local network, maybe iTunes Home Sharing is all you need. Here’s how to set it up. 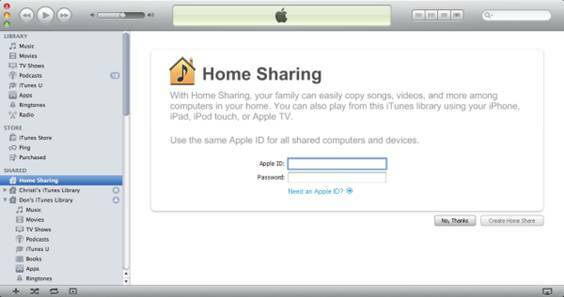 To stream your iTunes library to your new iPad/iPad 2, you will need to enable Home Sharing on both your Mac and iPad. 2. Choose Advanced > Turn On Home Sharing. 3. Enter your Apple ID and password that you use for the iTunes Store, then click Create Home Share. 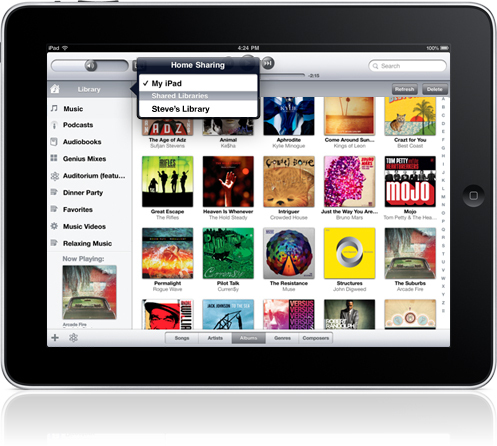 Note: To stream your iTunes library to your iPad, you will need iOS 4.3 or later. 1. On your iPad, tap Settings > iPod. 2. In the Home Sharing section, enter the same Apple ID and password you entered on your Mac and tap the return button. To watch shared videos on your iPad, tap on Videos > Shared and select a shared library. To listen to shared music on your iPad, tap on iPod > Library and select a shared library. Now you know how to stream movies from Mac to my iPad. But what if you shoot some pictures/footage with iPad and wanna to watch them on your iMac? Is it possible to do to stream movies from iPad to Mac computer wirelessly? Well, Apple has not come up with any solution for streaming from iPad to Mac, but there are some third-party developers that offer such kind of application (e.g. Reflection) in iTunes Store.